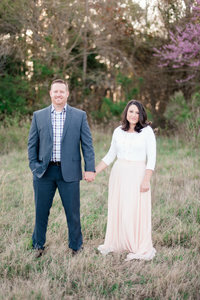 Sara & Paul tied the knot at Fords Colony on October 5th of this year! They went to Mexico for their honeymoon and enjoyed the nice warm weather and scenery as newlyweds. Once they returned Sara was on the hunt for a photographer. You see it had rained on her wedding day and they did not have the opportunity to get portraits together. This was a must for Sara and I definitely don’t blame her! So Sara & Paul donned their wedding apparel again and met us at CNU. We seriously couldn’t have asked for a better day. The leaves were almost at their peek and with the skies clear, it made for the perfect time to get their wedding pictures done. I love Day after Sessions…. Even though this wasn’t the day after, but you get the jest. Sometimes things happen that we cannot prevent. Weather, hair & makeup running over, people running late. It is apart of life and apart of weddings. When couples schedule a session afterwards then it relieves the stress of trying to get everything crunched in on a timeline. And I will be honest, when things do run behind or not go as planned the first thing to get cut is portrait time. I am so glad that Sara was determined to get their wedding pictures done. She will now have photographs to look back and remember that baby love they first had when they said I Do. She will now have photographs to show her children and grandchildren. Priceless memories that were captured that she will have for a lifetime. We had a lot of fun with these two. They are seriously a hoot. We loved getting to know them, hear about how they met, their wedding, and honeymoon. We spent the whole session laughing and having fun. I am blessed to have such awesome couples even those that trust us to capture after the wedding. The Nolands Trail at the Mariners Museum… Absolutely Stunning this time of year… Made me want to go for a run! So during this picture I had to fluff Sara’s Veil while Luke took the shot. What you don’t see is that there is not much room from them to a hill that slides down to the water…. Let’s just say I almost fell down the hill a few times to get this shot…. But oh so worth it! what a beautiful couple! I love the fall colors! Beautifully done on the most perfect fall day!